Smooth writing is something quite a few people desire, for both writing and sketching. Fountain pens are some of the smoothest writers available, but they have some convenience issues. And regular ballpoints require too much force for some people to write smoothly. 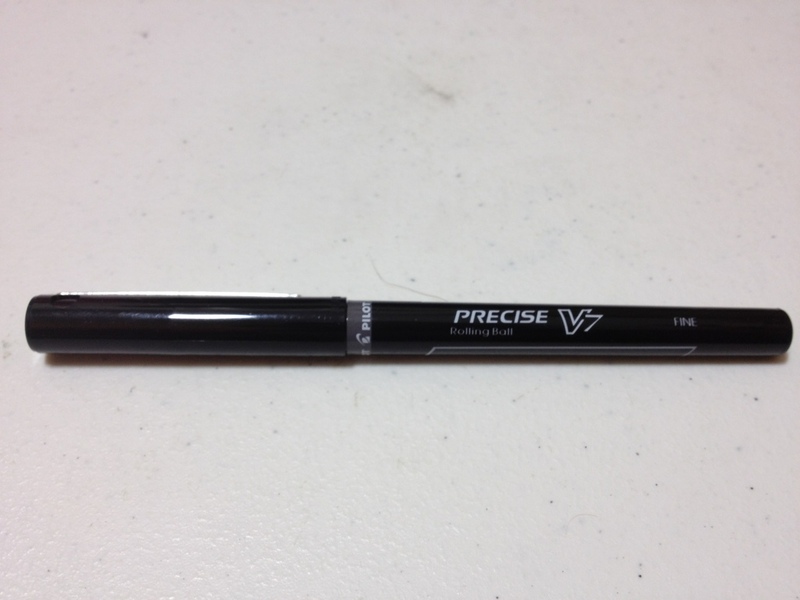 Pilot’s Precise line of liquid ink roller balls are meant to fill this gap in the pen market. This is the V7 black version. The pen body itself is straight, nice on the fingers, not slippery, but polished. All necessary info is printed on a label on the side, along with an ink window so you can view your supply, of which there is a lot. There is quite an interesting, fountain-pen-like feed which is clearly visible under the grip. It keeps up well with the writing. From there, there are some strange ribs leading up to an extended point with a rolling ball. The cap is simple: straight with a nice clip that works well and says “Pilot”, Though it does have some strange indents, it posts well. The V7 point is 7mm, which is shocking, I know. It is very smooth. 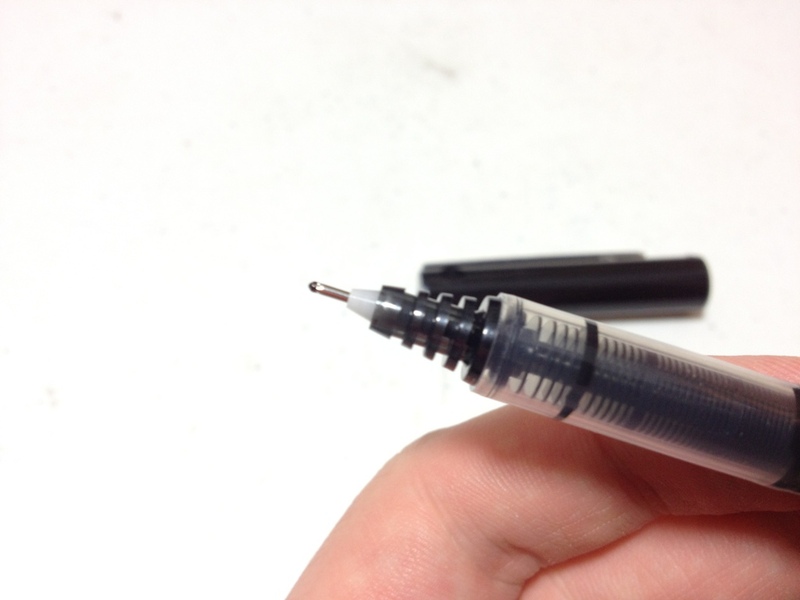 It dispenses ink handily and never skips unless it is dry from not putting the cap on. I also find it is less prone to get away from you as some of the other rollerball pens with fine points I’ve used are. The ink itself is quite black. It dries quickly but not immediately. It does get grey after some wetting or smearing, but this isn’t much of an issue. So overall this is a great “take everywhere” pen, for both artists and writers. Though I would recommend it more to artists because of the nature of the tip and liquid ink. I find that in sketching it pays to move fast, while in writing it doesn’t. Either way it’s a comfortable pen that writes super smooth and lays down a nice line of fairly black ink. It’s worth a look at least. This entry was posted in Beginner Supplies, Utensils and tagged art, pen, pilot, precise, review, rollerball, sketching, v7 by Dragon Co (Austin Smith). Bookmark the permalink.